Ever since Ben Bernanke began flooding the banking system with trillions of new dollars in the fall of 2008, economists and other pundits have disagreed on whether the US is in store for a grinding deflation or an accelerating inflation. Part of the disagreement stems from some people using the terms to refer to prices, whereas others refer to changes in the total quantity of money and credit. However, even if we restrict ourselves to movements in the prices that average households face in the marketplace, there is still widespread disagreement. Although the overlap isn't perfect, typically the Keynesians warn that with high unemployment, the US runs the risk of a Japanese "lost decade" of flat consumer prices and stagnant economic growth. Many Austrians, in contrast, warn of a different decade: namely the United States during the 1970s, when Americans suffered high unemployment and price inflation. To bolster their position, the Keynesians confidently point at the low yields on various government bonds, signaling that "the market" expects modest price increases over the coming years. In contrast, soaring gold and silver prices have been the trump cards for those Austrians predicting skyrocketing prices in general. For a while the Keynesians had no adequate response to this. They suggested that commodity prices were volatile, and that emerging market demand — coupled with production shortages — could explain the meteoric rise in gold and silver over the past few years. In a particular act of desperation, Paul Krugman recently suggested that gold was simply in a bubble pumped up by Glenn Beck. Yet now the Keynesians (and others who think the world is in a deflationary liquidity trap) seem to have settled on a secure new theory: gold prices allegedly jump in response to a low real rate of interest. If this theory is correct, the Keynesians can explain the high gold prices of both the 1970s and today, and can confidently maintain that Bernanke needs to open the monetary spigots to help the economic recovery. The theory linking gold prices to (real) interest rates isn't new, but lately it has become chic because of its relevance to the policy debate over Fed policy. Last October Eddy Elfenbein spelled out the basics and did some quick calibrations to derive a rule of thumb: "Whenever the dollar's real short-term interest rate is below 2%, gold rallies. Whenever the real short-term rate is above 2%, the price of gold falls." [S]uppose this is the right story, or at least a good part of the story, of gold prices. If so, just about everything you read about what gold prices mean is wrong. For this is essentially a "real" story about gold, in which the price has risen because expected returns on other investments have fallen; it is not, repeat not, a story about inflation expectations. Not only are surging gold prices not a sign of severe inflation just around the corner, they're actually the result of a persistently depressed economy stuck in a liquidity trap — an economy that basically faces the threat of Japanese-style deflation, not Weimar-style inflation. So people who bought gold because they believed that inflation was around the corner were right for the wrong reasons. On this interpretation gold is and always has been a super Treasury bond: a very long duration asset that is or at least is perceived to be "safe" in the sense that its price does not trade at a discount (due to risk and default premia) from a Treasury bond of the same duration but instead trades at a premium. What is the Austrian economist to make of these claims? Is it really true that the meteoric rise in gold can be chalked up primarily to a collapse in the real interest rate? Is the fear of dollar debasement truly just a figment of Glenn Beck's imagination? Although many in the deflationist camp think they've plugged the last chink in their armor, let's not rush to judgment. Far from providing a theoretically sound and empirically confirmed explanation, Krugman and DeLong have really just explained the two huge gold price spikes of the late 1970s and in the last few years. But there are other falsifiable implications of Krugman's model; let's see if it passes those tests too. If we study the dynamics of Krugman's model, we see that it implies that sudden and large changes in the real interest rate should lead to one-shot adjustments in the price of gold in the opposite direction. This is the mechanism, after all, by which Krugman thinks he has adequately explained the sharp rise in gold prices over the last few years. Yet there are large stretches in the above chart that do not fit this story. For example, the real interest rate (as measured by 20-year TIPS yields) rose quite sharply from 2.06 percent on January 3, 2006, to 2.58 percent by July 3 of that year. That's a very strong move for such a short time period. 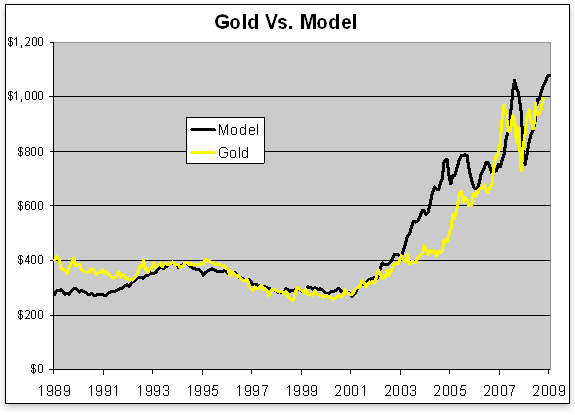 It's unclear how much this shift should have moved the price of gold, since Krugman's model is qualitative. To actually calculate the new equilibrium spot price, we'd need to plug in a number for what he calls the "choke price" of gold, at which nobody would buy gold for industrial or commercial applications. Yet regardless of the size of the move, the direction is perfectly clear: if Krugman's basic story is right, then this large increase in the "real rate of interest" over a six-month period should clearly have reduced the real price of gold. So how well does Krugman's theory hold up? Eyeballing the charts at Kitco, the spot price of gold in early January 2006 was $530. By early July the spot price had risen to $623. After adjusting for the change in official CPI, that's still a 15 percent increase in the "real" price of gold, during a short stretch when Krugman's theory says gold prices should have gone down, and probably sharply. Oops. Krugman's model has other implications, too. For example, if the real interest rate holds steady for an extended stretch, then the real price of gold should rise (on an annualized basis) by the same rate during that period. Unfortunately, the yield on the 20-year TIPS bounces all over the place, so it's hard to test this implication. 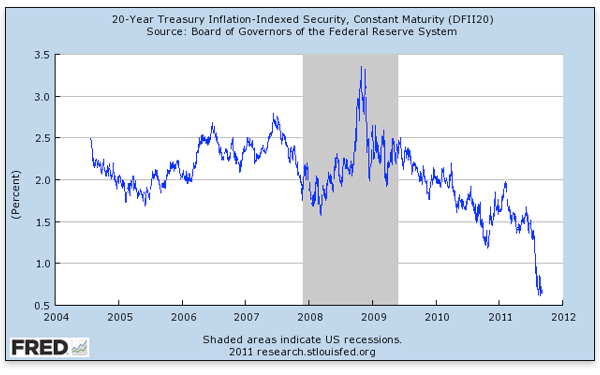 Even so, as the chart above indicates, the yield is relatively calm during the year 2005, and hovers around 2 percent. Sometimes it's lower, sometimes it's higher, but it doesn't stray too far from 2 percent during the year, at least compared to how volatile it is on the rest of the graph. So if Krugman's model were the whole story, then the real price of gold should have increased only about 2 percent during the year 2005. In fact, the spot price increased from $428 to $512; after adjusting for the change in CPI, the real price increased about 16 percent. To sum up, whether we're looking at large moves in the real interest rate over shorter periods, or fairly steady real interest rates over longer periods, there are patches using Krugman's own data set that are at complete odds with his model. Krugman and DeLong think they solved their pesky problem of rising gold prices, but they really haven't. They came up with a qualitative model in which sudden drops in the real interest rate lead to instantaneous upward shifts in the price of gold. Seeing this result, they declared, "Mission accomplished!" and cracked open some beers. But there are several other implications of their model that fail to match the data. The relationship isn't perfect but it's held up fairly well over the past 15 years or so. The same dynamic seems at work in the 15 years before that, but I think the ratios are different. That's fine as far as it goes, and perhaps short-term traders in the markets will find Elfenbein's model useful. However, he clearly hasn't given us "the" model of gold, since he himself admits that (a) it doesn't dovetail with any theoretical explanation and (b) it really only "works" when he restricts the data to a certain period and then plays with parameters to get the best fit. With such a procedure, one might "explain" gold prices by reference to all sorts of things. Let me make this clear that this is just a model and I'm not trying to explain 100% of gold's movement. Gold is subject to a high degree of volatility and speculation. Geopolitical events, for example, can impact the price of gold. In the section above I showed the shortcomings of the real-interest-rate theory in terms that even mainstream economists can appreciate. But now I want to point out the fundamental problem with the approach of Krugman et al. : they are trying to explain the price of gold while ignoring its historical function as the market's money. Notice the part I emphasized: Krugman is quite consciously ignoring the fact that there are some people out there who hold gold "that just sits there." He says, "never mind for now," but he never comes back to this crucial point. But the question is, "How can anyone reasonably calculate what the price of gold is?" For stocks, we have all sorts of ratios. Sure, those ratios can be off … but at least they're something. With gold, we have nothing. After all, gold is just a rock (ok ok, an element). How the heck can we even begin to analyze gold's value? There's an old joke that the price of gold is understood by exactly two people in the entire world. They both work for the Bank of England and they disagree. It is clear that neither Krugman nor Elfenbein has any appreciation for the historical role of gold (and silver) as a medium of exchange. Ludwig von Mises, in his classic work The Theory of Money and Credit, explained systematically how gold can begin as a normal commodity, with its relative price determined by its use as a factor of production. Once we understand gold's historical role as the world's market-based commodity money, we can see why it is the inflation hedge par excellence, and also why people rush into gold when they are fearful. The equilibrium relationships described by Krugman et al., need to be true, other things equal, but they have by no means demonstrated that Bernanke needs to inflate more. When bad news from Greece causes Treasury prices to rise, everybody accepts the commonsense explanation that, "Investors are fleeing the euro into the dollar." So why should it be such a mystery that Bernanke's incredible dollar pumping would send worried investors into safe-haven currencies (gold and silver) that cannot be debased? There are plenty of investors — including small potatoes as well as big guns such as Jim Rogers and Marc Faber — who are quite clear about why Bernanke's policies have pushed up commodities in general, and the precious metals in particular. We don't need to draw up fancy models to get inside their heads; these people are screaming their motivations at us every day. Now perhaps these high-profile investors are wrong, and we really are in store for stable consumer prices as far as the eye can see. But I don't think so, and neither do the millions of other people rushing into gold. © 2011 Copyright Robert Murphy - All Rights Reserved Disclaimer: The above is a matter of opinion provided for general information purposes only and is not intended as investment advice. Information and analysis above are derived from sources and utilising methods believed to be reliable, but we cannot accept responsibility for any losses you may incur as a result of this analysis. Individuals should consult with their personal financial advisors.